Akoum. Just an ocean away. The behemoth is tireless in its swim through the ocean, and Nissa figures they'll make it to Akoum in two days. Day one a flock of... something... approaches that is soon clear is actually a group of flying Eldrazi spawn. With Sorin looking so worn, their limited options on fighting them of runs through her head as they circle the. Then for no reason she can guess, the brood lineage take off and head west and leave them in peace. When Nissa asks Anowon if he knows why they did that. He tells her he doesn't know. Sorin buts in and says that he knows what she is. "I konw what you are able to do," Sorin continued. "That you posses the ability to walk to the other planes." Nissa set her eyes on Sorin, and gave him what she hoped came off as a steady, level stare. "I am not oddity. Why would you suppose I was?" Sorin then tells her that brood lineage cannot be put back into the prison they broke out of, but they aren't the true threat. They're searching for the way to free the true Eldrazi titans. The Eldrazi move from plane to plane. He tells her this so she knows what they face when the get to Akoum. He'll have need of her skills, and she cannot refuse. Zendikar depends on it. All sorts of questions run through Nissa's head as she lets it all sink in. She wonders who the Eldrazi came to be on Zendikar in the first place, who Sorin really is, who sent him here and why, and she wonders how he can possibly know so much more than a native of Zendikar. The sun begins to rise before Nissa knows it, and land is in sight. Anowon comes over and asks her what's wrong when she takes a look at her map, and when she tells him the map is missing all the ports he tells her that Akoum has no ports. The continent of Akoum is very different from Ondu. The shore is surrounded by crystals as sharp as a knife's edge and they can amplify the sun rays strong enough to cook someone in moments. There will likely be humans on shore, ready to assist them, but those humans could very well be bandits. Akoum also suffers Roils at much more frequent intervals. "Why do you disturb the slumber of the sleeper in the deep?" "Who is he?" Sorin said innocently. They eyebrow shells above the kraken's eyes dropped. 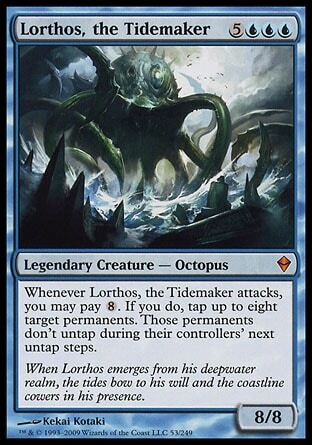 "He is Lorthos, the Tidemaker. He is I," the creature said. A simple apology will not appease him. Lorthos finds a small rock and crouches on top of it and says that only a blood sacrifice will do. Sorin takes one of the remaining goblins and throws it into the water. Lorthos dives back in and takes the goblin, but it's not enough. But when Lorthos demands more else he'll crack all their skulls and eat all their brains, Sorin declares that no one's brains will be eaten today. Surely he must know that. "Do you not remember me, fishmaster?" Sorin boomed. Nissa had to crouch down on the deck of the ship. Something about Sorin's voice made the parts inside her stomach and chest vibrate, and she suddenly felt nauseous. The kraken looked closer at Sorin. "You?" it said after its examination. "You have returned?" While something about the history between the two of them makes Lorthos pause for a second, he calls Sorin's bluff. There's one thing left that Nissa can think to try. She's heard the rumors of Lorthos and Sutina, and so she uses news about the Speaker as a bargaining chip. News about Sutina in exchange not just for their lives, but assistance in getting safely past the crystal hazards and onto Akoum's shore. Nissa not only tells him of Sutina's death, but of the creatures that killed her. Lorthos doesn't believe her at first, but does so eventually, and he takes them to shore with his blessing for their success in stopping the Eldrazi. First part was actually pretty good. At least in relation to the rest of the book. It's finally out in the open that both Nissa and Sorin are planeswalkers, there is going to be no more wasted space about the big "secret" that is known to the readers before even picking up the book. And it's not just the secret that's spilled. Sorin actually explains more of what he knows about the Eldrazi. That's the first big helping of plot development since Chapter 3 with Kahlled. Unfortunately the whole "Sorin is strange for a human" plot thread is still going. There are some size issues going on with Lorthos, both in terms of Lorthos and his small rock, but more importantly with Lorthos and Sutina. I was thinking that the whole rumors of their "coupling" was exactly that. Rumors. But it's actually true? I don't quite understand how that works physically, but maybe it's best I don't let my thoughts linger on that. I'll just be happy with some plot development and move on. Woah, it only took 8 chapters to move the plot forward slightly (by having the characters share information that the readers already knew). That's gotta be like a new record! Thank you on the Lorthos commentary! I had no idea what Wintermute was thinking back then while reading it, and this makes the novel slightly better!